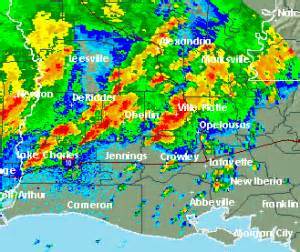 A 5 a.m. thunder clap turned out to be a death knell for the Teurlings Catholic Rebel Open, which would have been Louisiana's first wrestling tournament held outdoors. 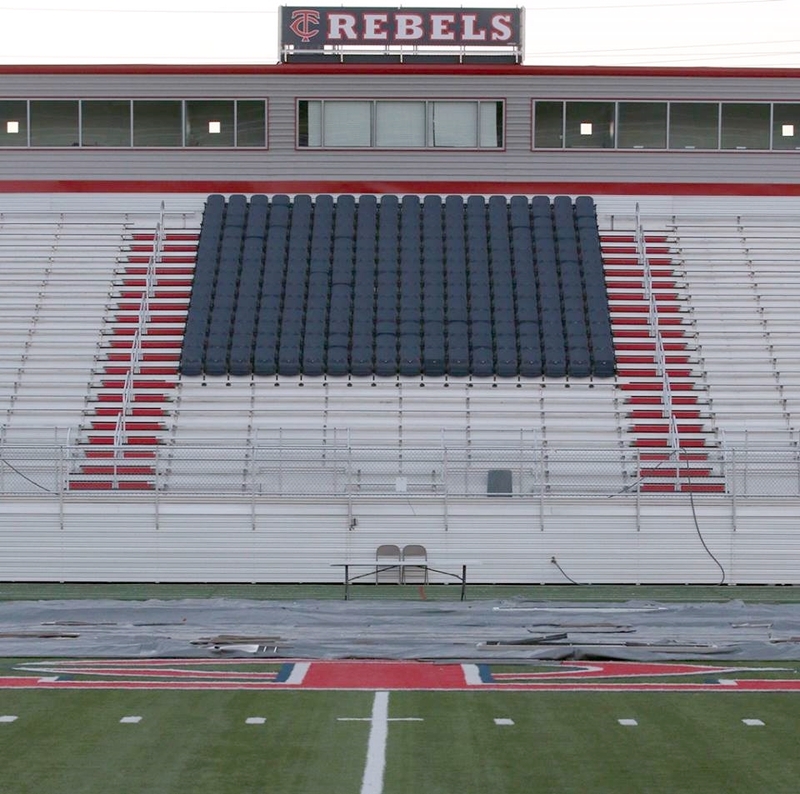 With only a 20% chance of rain predicted locally in Lafayette for Saturday, the tournament directors decided to risk it and leave the mats on the Rebel football field overnight. The weather, however, did not cooperate. By 9 a.m. a constant drizzle pelted the stadium as teams hovered under available overhangs to keep dry. 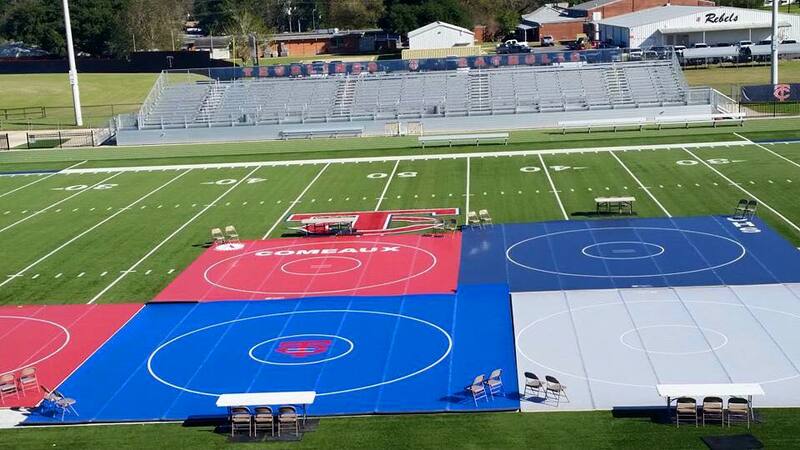 To make matters worse, the backup plan to hold the event in the Lafayette High School gym in the event it rained fell through Saturday morning. Teurlings Catholic coach Kent Masson said they would try it again next year and make sure their backup plan is infallible. The cancellation prevented Teurlings Catholic from getting their first matches of the season, so they will make their debut at the Spartan Open on Monday (JH/JV) and Tuesday (varsity). Not all was lost, however as, after they returned to the GNO area, Jesuit and Rummel held an impromptu dual meet. Brother Martin's depth showed again as a group of mostly non-varsity starters (for the moment, anyway) won the inaugural "Bulldog Brawl" at Fontainebleau on Saturday, securing 12 places. The young Crusaders only had three champions but the team scored more falls than runner-up Fontainebleau, who had three champions among 13 placers, yet ended up 24.5 points behind the champs. East Ascension was one-half point behind Fontainebleau and 39 points ahead of Ocean Springs, MS, which finished fourth. Results and brackets of this event may be found on the LHSWA Website. The Catholic Bears placed seven wrestlers en route to winning the Cy Ridge Classic by 19 points over runner-up Conroe Oakridge. The Bears bested 35 other teams in the two-day event. Junior Cameron Carpenter remained undefeated on the year (11-0) in taking the 120 lbs. championship. Senior Nick Danna (12-1) suffered his first loss of the season by placing second. In a quad meet at Brusly featuring Baton Rouge, Brusly, Holy Cross (non-starters) and St. Amant, a second upset of the week was recorded in the 170 lbs. weight class. On Wednesday St. Amant junior Sage Nugent preserved his undefeated season with a 3-2 win over Brother Martin's Pierce Williams, the 2015 Division I runner-up at 170 lbs. On Saturday Nugent faced 2015 Division III state champion Richard Hunter, who dropped to 170 lbs. for the first time this season. (At 182 lbs. Hunter was 7-2, with his two losses coming from 2015 Division I state champion Josh Ramirez of Rummel.) Initially the match was very close, but in the third period the two chose to grapple with their upper bodies, and Hunter used a bear hug to put Nugent on his back, prompting a fall in 5:33. Look for Hunter to be the top seed at Tuesday's Spartan Invitational. St. Paul's travelled to Georgia for the Prep Duals held on Friday and Saturday at the Woodward Academy in College Park (outside Atlanta). The Wolves went 4-0, defeating Westminster 75-6, The Walker School 84-0, Mt. Pisgah Christian School 82-0 and Woodward Academy 66-10. Billy Harrison went 4-0 for the Wolves. Going 3-0 were Brandon Stein, Cole Houser, Shane Ulfers, Hunter Bourgeois, Seth Dragon and Sam Dufour. 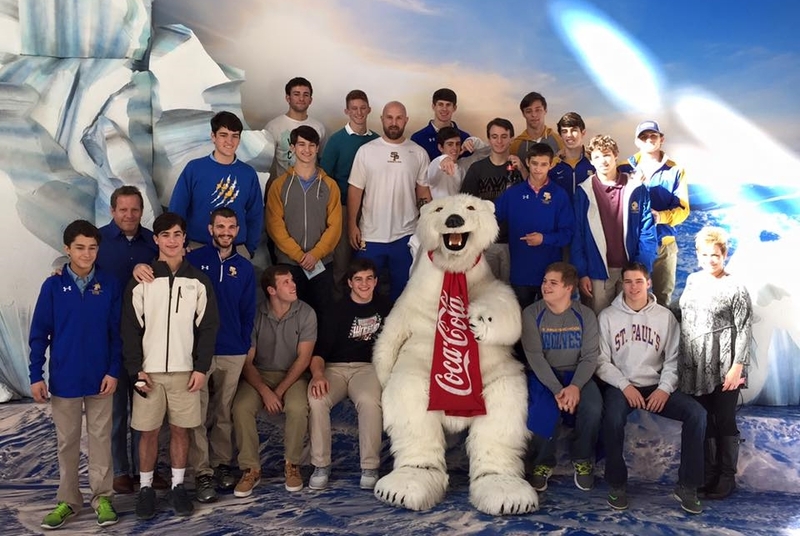 While there the Wolves attended a movie and also made a trip to the The World of Coca-Cola Museum in downtown Atlanta (photo left).